It was supposed to happen circa 2005. Then in 2009. Now the city says the restoration of a crumbling block-long staircase that serves as a pedestrian-only street in Inwood will be finished by summer 2013. 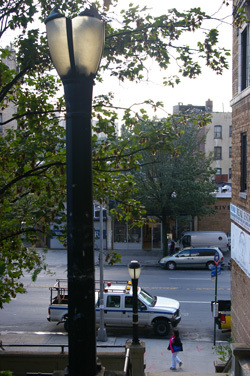 The 215th Step-Street connects Broadway to residential blocks at Inwood’s northern end. For years its cracked stairs and broken lamps have posed a hazard — neighborhood residents have been asking the city to rebuild it since at least 1999. In 2007 a woman tripped on a hole in the stairs, cutting her legs and face, prompting renewed calls for action. In 2008, DOT officials and then-Assembly Member Adriano Espaillat announced that a reconstruction project would be completed the following year. Instead, in the summer of 2009 the city backed off its pledge. Now the Department of Design and Construction says plans are moving forward. While the news is promising, Inwoodites could be forgiven for not holding their breath. 1) People like to loiter at the top and the foot, which is by design after all (integral benches are part of the structure). But the way city sanitation works, garbage cans have to go by the curb so that the workers will pick them up without having to walk. As a result, there are no cans in these nooks and the litter is nearly a 24/7 problem. The new design may have to remove the benches and replace them with more planters, in my opinion. 2) Drainage for so many landings was poorly designed and prone to clogging. I have no faith in a rebuilt stair performing any better. The landings should be pitched to simply drain to the landscape median, no actual pipes to clog. 3) Step streets pretty much do not exist in 311. Just try calling to report graffiti or a burned out light. 311 operators have no idea what these are and no way to log them. Hopefully the rebuilding will lessen these maintenance matters but I am concerned about people who design things they themselves do not use. I also live near these and use them regularly day and night. iSkyscraper notes a few issues – the drainage can be a hassle. They could use some repair, but they don’t strike me as falling into the decrepit category. Of course if 2013 becomes 2015 . . . . This is a big opportunity to improve upon a vital piece of infrastructure and even make it a community selling point…here’s hoping DDC gets it right. it’s an attractive design with many nice touches, including restoration/preservation of the historic lamps, a split staircase with central tree-planted areas (as opposed to a straight-across staircase design which DDC inexplicably favored initially), a bicycle wheel track, energey-efficient lighting, etc. plans were subject to an extensive public review process, and input by CB12 and many inwood neighbors helped to strengthen the design. Last January, we spotlighted 11 street redesign projects where the city's Department of Design and Construction had fallen years behind schedule. One year later, most of those projects are still not finished, but before we get to those, here are the long-delayed DDC projects that wrapped up in 2016. DOT proposed improvements to an Inwood intersection where the A train connects with several bus lines. Then nothing happened.